Few weeks before, my mom sent me a bag of horse gram which had grown in our fields. As an immediate effect of blogging, I collected notes of making different recipes using it. My grandma gave me a suggestion of preparing rasam, sundal, vadai and cutlet using it. I prepared all of them using it but I was able to click only this kollu vadai recipe. The preparation is exactly the same like how we prepare paruppu vadai. If you are not aware of what is kollu, read here. Even if You hate kollu, you like this crispy vada. It is an alternate way to make your kids to eat healthy food. 1) Soak kollu in 2 cups of water for 2-3 hours. 2) After 3 hours, drain the water completely with the help of colander. 3) Grind the kollu coarsely without adding water. Transfer the ground kollu to a bowl. cover and keep aside for 10 minutes. Meanwhile you can chop other ingredients like onion and green chilli. 4) After 10 minutes, add chopped onion, green chilli, ginger, curry leaves, coriander leaves, asafoetida, cumin seeds and salt to the ground kollu. Mix it well. 5) Heat oil in the pan. 6) Meanwhile, take a small lemon sized kollu from the bowl and slightly press it to form the patties. Use Ziploc or any clean polythene cover to do this job easier. 7) Now, the oil would have come to the medium hot temperature. Check it and drop the patties one by one slowly into the oil. 8) Fry till both the sides turns crispy and slightly darker in colour. Flip in between using a ladle for proper frying of patties. 9) Once done, transfer to the plate covered with paper tissue to absorb the excess oil. 10) Serve hot with coconut chutney or any sauce. never cooked with horsegram. the vadas look fantastic. I love vada's !! This is quiet unique and interesting one !! so crispy and detectable !! Anytime snack with hot tea.......love it. Interesting recipe Uma,never tried vada out f kollu.I will give a try for sure.The vada looks so crisp and tempting. Kollu is very healthy and tasty. I am sure it would have added a lot of flavor to the vadai. I wish we an find kollu here. The quality is not that great. 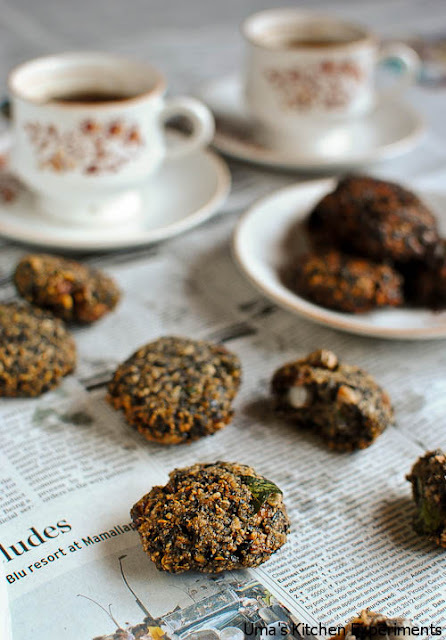 Very tempting snack, never though that we can make vadas with kollu. 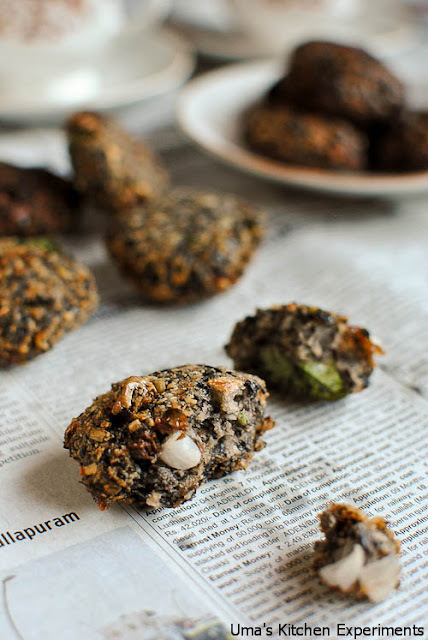 Never heard of vadai from kollu..Innovative and healthy version of vadas. 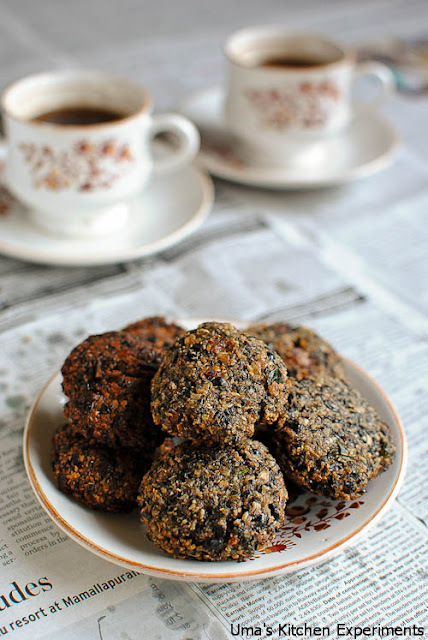 Horse grams are new ingredients for me...your post has make me crave for them...they look delicious and a great accompaniment with a hot cup of coffee/tea. tempting n yummy vadas,never had these before ..Interesting one!! wow, nice recipe, vada looks so delicious. I love your pictures in this post. 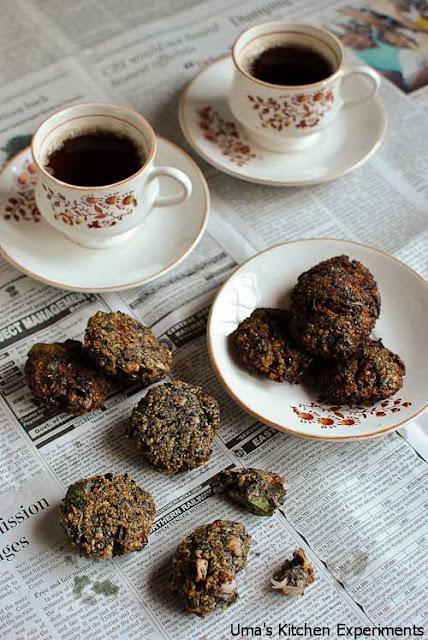 Nice vadai..perfect with a cup of tea! Love kollu in any form! This kollu vada is my favorite too.. This is such an awesome recipe Uma! I know of Appalam and Sambar.. But, never knew they made vada out of Kollu..
Glad to have discovered your recipes..
Nice idea to make kollu vadai. Should be healthy and tasting good too! I prepared them long back, feel like grabbing some,super crispy vadas..
looks so tempting..love the way you presented them..superb!! Love these vadas!! wonderful clicks n superb presentation!! that colour is so pretty, never seen a black vada before!